Ide na #techno w collabie z klubem Schron zapraszają na mega wydarzenie! headlinerem będzie Torsten Kanzler ! Torsten Kanzler stands for impulsive and powerful techno. Like a chief engineer he operates his set and takes the crowd into a universe of mind-blowing drum- arrangements, creaking synths and warm growling basslines, using „Maschine“ of Native Instrument, two Allen & Heath Xone K2, and an iPad. His direct interaction combined with a spontaneous set with up to four decks spinning make his sets a true happening. His gigs in all the high places around the globe stand for powerful and profound techno as well as his numerous productions, which make their way into well-known international acts' record bags. Numerous releases on in-demand labels or his own with passion run imprint TKR stand on their own and reflect his obsession and love for techno. 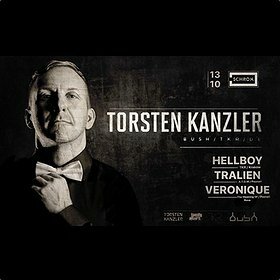 Whether as a DJ, producer, or remixer Torsten Kanzler lives techno.